When I was visiting my sister, I wanted to introduce her to the amazing world of do-it-yourself baked cheese via a Baked Camembert. However, I was unable to find any Camembert at her local grocery store. I did find a small round of goat brie which immediately captivated me. 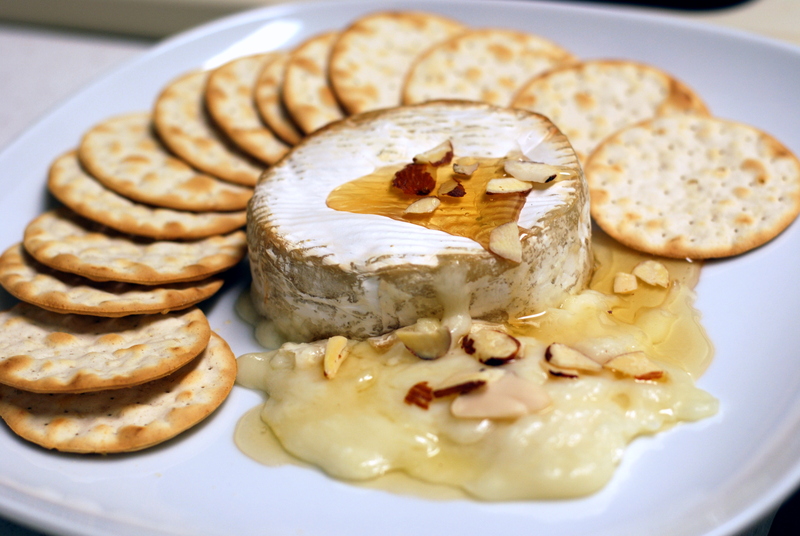 I absolutely love goat cheese and the idea of a goat brie was too tempting to pass up. 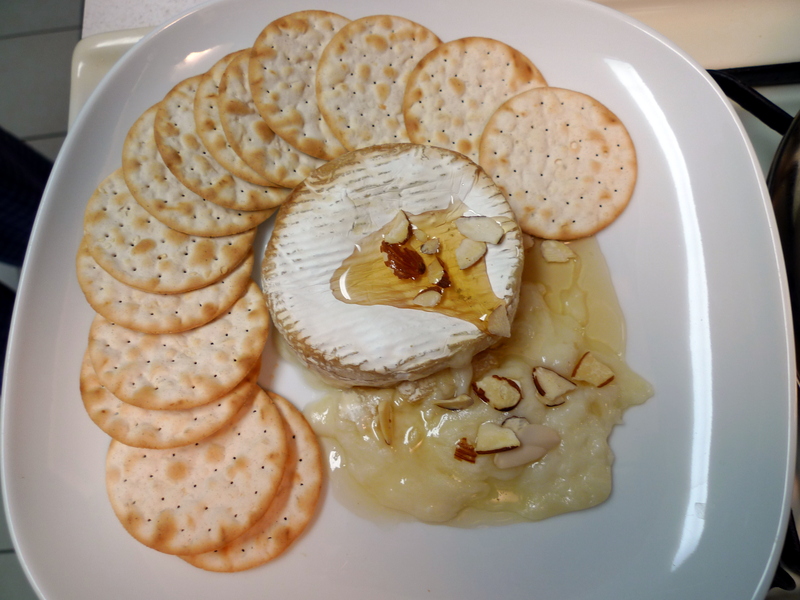 I knew regular cow’s milk brie is terrific baked (I remember watching a cooking show when the chef just threw in a giant wheel of brie in the oven and it just blew my mind), so figured goat brie could work just as well. In general, I think any soft cheese with a decent rind could be baked and would result in that perfect oozing, gooey, runny texture. There are plenty of recipes for baked brie wrapped in phyllo, and while I am sure it’d taste incredible, I felt it was an unnecessary step and scooping the warm baked brie on some of my favorite Carr’s water crackers would work just as well. My sister and I devoured this whole thing within minutes! Optional: fruit jam, cranberry sauce, etc. Preheat oven to 400°F. 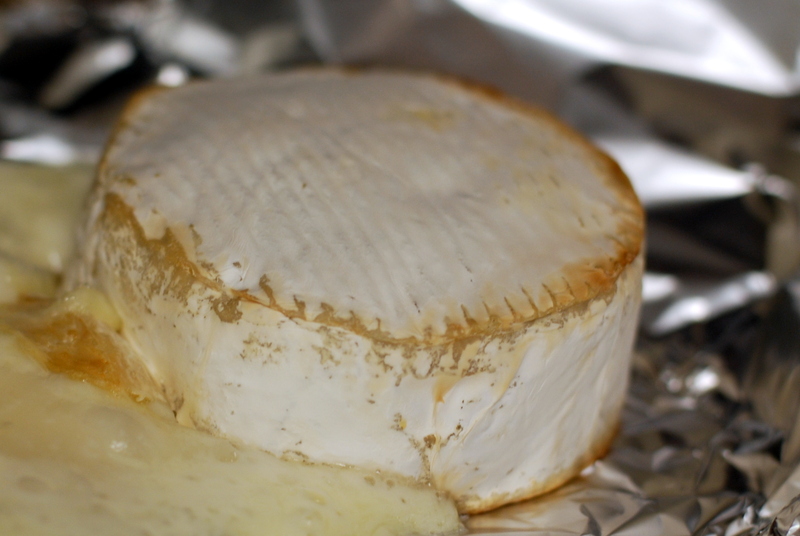 Place the brie round, rind and all, on a parchment or foil lined baking sheet. Bake the brie for 10 minutes until just oozing a bit of cheese out of the bottom. If you bake it too long (like I did as pictured below hah), all the gooey cheese melts out and at the end you just end up with a hollow rind! Oops… well it was still good scraping the melted cheese off the foil. Remove from the oven and put on a platter. Drizzle with honey and sprinkle with toasted almond slices. Optionally: spoon some fruit jam with each cheesy bite. Enjoy immediately with some crackers!